If you have any questions regarding Bentbrook Boxers, you can contact us by calling or e-mailing and we'll get back to you as soon as possible. Since 1978 Barb has been involved with breeding and proudly exhibiting her outstanding BENTBROOK BOXERS. Through the years she has bred many top National Winners, Regional Winners, Multiple Specialty Winners, Best in Show Winners as well as a few foreignaffairsaffairs International Best of Breed and Group Winners. Added to this line-up in 2005 is a Swedish Obedience Champion and qualifier for Crufts bred by Barb! 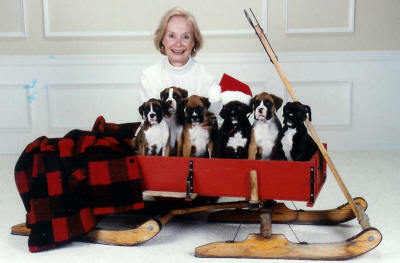 Barb has been a long standing member of the American Boxer Club, Michigan Boxer Club and the Boxer Club of Canada. She was a 2002-2003 Regional District Director for the American Boxer Club and has been a member with her husband in several Boxer organizations. 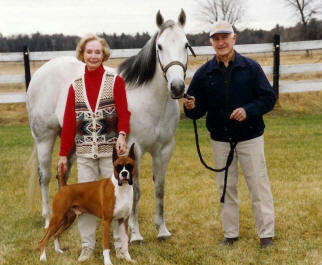 Barb shares along with her husband a great love for horses but finds her true commitment through the years to her Boxers. Barb and her husband Charles have always had a great fondness for animals and they have played a major part in their lives. In the early years, as their children were growing up, there were always a couple of pet Boxers as household members. Barb would refer to them as her "Nanny's" because they were constantly with her 6 children always keeping a close, protective and loving eye on them. Another passion in which they both take particular pleasure is contributing to the Arts through their sponsorship and promotion of emerging outstanding Jazz artists in the United States. Barb and Charlie have attended numerous Jazz Fests through the years. A favorite one they enjoy attending each year is DjangoFest Northwest which features each year many outstanding U.S. and European Gypsy Jazz groups. The Carrolls have been major sponsors of this huge event for several years in a row: Among some of the Jazz Groups they have sponsored are Alfonso Ponticelli and "Swing Gitan" from Chicago ,the "Hot Club of San Diego", Pearl Django from Seattle to name just a few.